A handful of befuddled but beautifully realized characters fall through the tears in the cultural fabric of a too-rapidly modernizing China in Zhangke Jia’s A Touch of Sin. The film sets four tales spinning simultaneously, each uncovering the unpredictable challenges and opportunities facing four characters who are dealing with capitalistic expansion, an unprecedented and often unstructured change in more than just their economic reality. As each grapples with the task of making a living among the unscrupulous who’ve already learned to exploit the fledgling economy, bloodshed becomes ever more appealing. Jia’s imagination and scope are epic, but his film remains intimate. 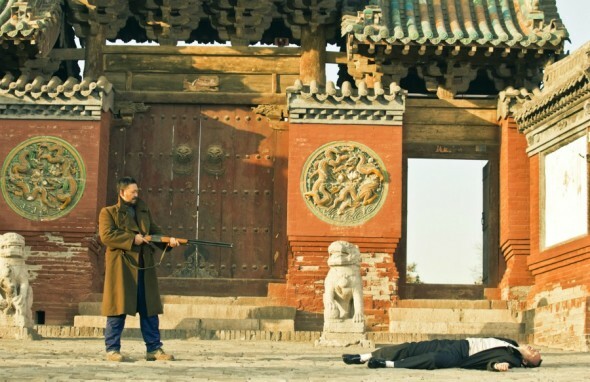 Though his pacing is slower and his dialog certainly more restrained, Jia’s film draws on some of Tarantino’s staging preferences when push comes to puncture wounds and bullet holes. Like Tarantino, though, Jia never abandons his characters. He remains invested in each one, whether it’s the disgruntled miner hoping to hold village officials responsible for community welfare, the young woman defending her honor to herself as well as her unwelcome suitors, the transient who enjoys his freedom and his handgun, or the adolescent thrashing desperately against a lifelong outlook of meager wages and soul-crushing employers. The physical environment is as unforgiving as anything in this bleak, colorless winter where everyone looks cold and uncomfortable – not abjectly miserable, just utterly unhappy. It’s a perfect backdrop for these lost souls, although Jia seems to be suggesting that these outcasts may not be all that atypical. Not one is in an entirely unique situation, and only the gun-happy transient even seems like an odd duck. No, these are very regular people who finally, irrevocably react rather than submit. This is the real brilliance in his film. With each passing storyline, the line between “he just snapped” and “would I have done the same” blurs. Jia wonders throughout how an intelligent, rational person is supposed to manage with no future.